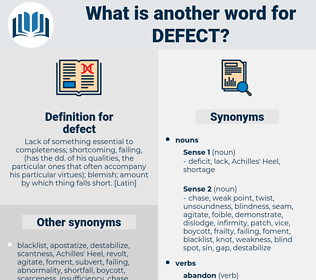 What is another word for defect? anomaly, malfunction, fault, deficit, mistake, disadvantage, defective, disorder, impropriety, impairment, vice, necrosis, shortage, inconsistency, discrepancy, imbalance, inadequacy, handicap, faulty, default, incidence, snag, breakdown, gap, insufficiency, aberration, downside, disability. irregularity, failure, abnormality, malformation, drawback, failing, error, deformity, shortfall, loophole, omission, lacuna, Lacunae. boon, sufficiency, strength, strong point, benefit, plenty, abundance, correction, certainty, cleanliness, improvement, perfection, success, blank, enough, closure, correctness, accuracy, line, truth, advantage, right, good, clarity, blessing. decoration, enhancement, embellishment, ornament, adornment. persevere, stay, approve, come in, continue, join, allow, support, come, remain. Even while it depressed for the time the ideal of spiritual attainment, the defect was temporary, but the work real. The young woman, if she were not mistaken, had just the qualities needed to make a useful citizen out of a husband like Copley whose chief defect was clearly a lack of decision. deep-seated, depict, diffused, depicted, deposit, deep south, dovecote, divagate, divest, diapsida, deficit, data-based, debased, de facto, deep-chested, deep pocket, diapsid, devastate, dope sheet, dibasic acid, defaced, debauched, dopastat, deep-set. congenital abnormality, congenital defect, congenital anomaly, myelatelia, congenital disorder, birth defect.